My journey to Abilities United began over six decades ago when my parents of beloved memory had a baby boy, my brother. Shortly before he turned one, he was diagnosed with congenital brain damage–a fluke of nature, the doctors explained. Two years later another baby boy arrived and, sadly, nature repeated itself. The boys lived short lives, succumbing to pneumonia at ages two and four. Happily, an adopted son later joined our family. After many intervening years of academic wanderings, my husband Tom and I finally settled back into our Palo Alto home that had been rented for 21 years. 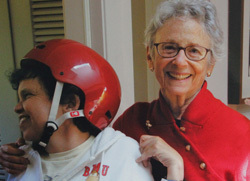 At that time my college classmate Rosemary Enthoven was the president of what is now Abilities United. She swiftly recruited me. Luckily for me I joined Board of Directors. It was a perfect opportunity for me to honor my parents. Little did Tom and I know then that when our first grandchild was born three months prematurely he would swim early on at the Betty Wright Swim Center at Abilities United. Now he is a strapping college junior! As is so often the case with volunteering, I have received far more from this superb agency than I have given. Looking back, I cannot imagine how my mother and father managed in Chicago without the warm embrace and skilled services of Abilities United staff. May all in our community benefit from another 50 years of such excellence. Written by Ellen Ehrlich. Edited by Ellen Ehrlich and Bob Thomas.